The Sweet range of hardware is here and available on our doors. Our standard products available in just 5 days lead time! 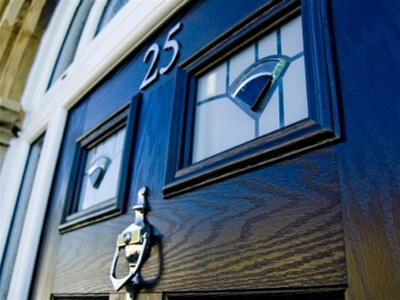 As a leading trade supplier of VEKA uPVC windows, doors and conservatories, we offer one of the most comprehensive product ranges on the market. By supporting our installers with technical advice and marketing support, we're confident that we can help grow your business in the areas that are important to you. It's not just about buying our products, working with Glazerite means you are part of a much bigger company, giving you access to a wealth of expertise and advice through our HR, Accounting, Finance and Marketing functions. This gives you a solid base to rely on giving you clear direction, whilst leaving you to get on with the important stuff. Our industry is ever changing, our technical hub gives you the latest news and information on product developments and changing standards. Our network of installers benefit from one of the most comprehensive product ranges in the industry. We also offer marketing support for our customers and are confident that we can help grow your business. Specialist barn and farm buildings renovator Cheshire Barns Homes is committed to using traditional materials in keeping with the projects they typically undertake... but it seems Halo FlushSash has turned their head. The developer has a strong commitment to producing homes using traditional farm buildings that are energy efficient, a philosophy that is underpinned by the company's founder and director, Rhys Nevett, who has a vision to restore buildings with heritage to create sustainable luxury and a desire for absolute perfection. 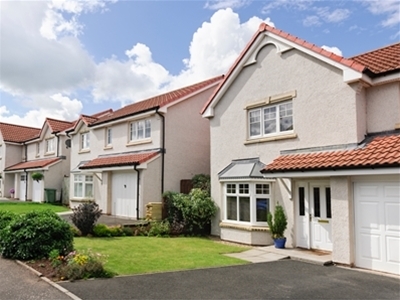 The traditional style of the properties they renovate must be considered against the requirements of the Building Regulations and desire of the new owners for modern comfort and performance, a balance that can be difficult to achieve. 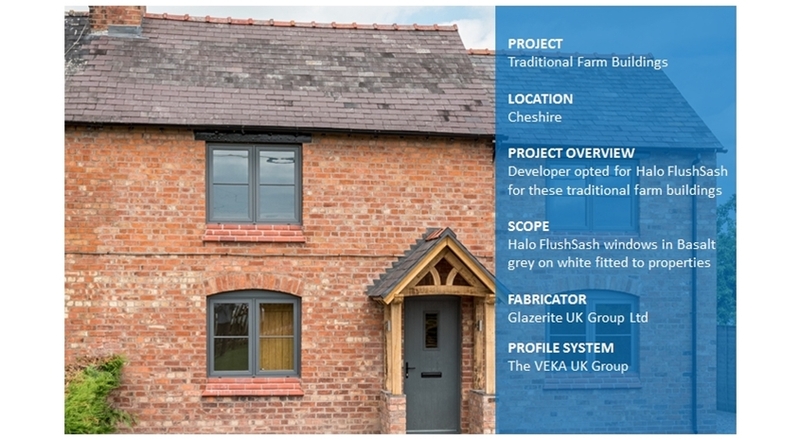 But for one recent project undertaken by Cheshire Barn Homes such potential conflicts were resolved when the firm chose Halo FlushSash PVC-U windows, for a semi-detached property located in a rural location. Nottingham-based Fearns of Carlton were chosen by the developer to supply eight Halo FlushSash windows produced in Basalt Grey on white, after being impressed with the authentic appearance of the frames combined with the exceptional performance. 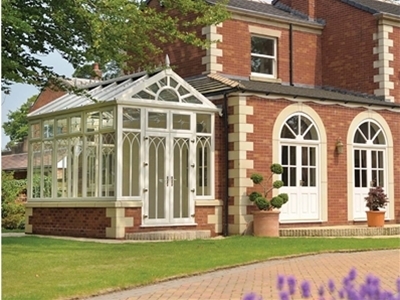 The colour was selected from a range of 29 foils available on this highly popular traditionally styled window, with the frames manufactured by Glazerite UK Group at the company's Peterborough factory. Rhys Nevett of Cheshire Barns Homes is committed to maintaining the traditional appearance of the properties he renovates and was impressed with the Halo FlushSash windows chosen for this project: "We are usually committed to genuine timber windows but when we saw the Halo window and learned of the energy efficiency that they brought to the project, we had no hesitation in specifying them. They provide an impressive authentic appearance that is in keeping with this project." For the window supplier Fearns of Carlton Jak Fearn said: "Many of the projects I work on are with timber sash windows as they are listed buildings. Fortunately as this project wasn't listed so it gave the developer and us the opportunity to specify the Halo FlushSash. It not only looks great but offers an "A" rating which is fantastic for a traditional property." Chris Thompson of Glazerite was delighted: "There is northing I love more than to get a timber window installer onto PVC-U. We have also had a number of installations approved and passed by building control in covservation and listed buildings so even if a property is in such an area the installation of windows manufactured in modern materials should not be ruled out."